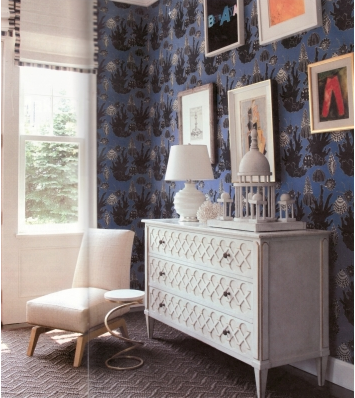 We love this beautiful Lulu DK wallpaper aptly named Sunshine! This month's ELLE DECOR shows Alexandra Wentworth's Colonial revival house in Georgetown which is a testament to style, tradition and family life. Make sure you look this up and read about this super stylish home. BTW this gorgeous wallpaper comes in chocolate, red and navy and has fabric to match!